I've been doing more quilting than sewing, so the design wall is a mish-mash of chunky log cabin blocks. I've been strip piecing them, which might not be working for a leader/ender project - I had to put the blocks up on the wall because I kept losing track of which step I was on. I'm going to cut the necessary pieces to finish these twelve - I'll need something easy to grab when I'm making bindings later this week. 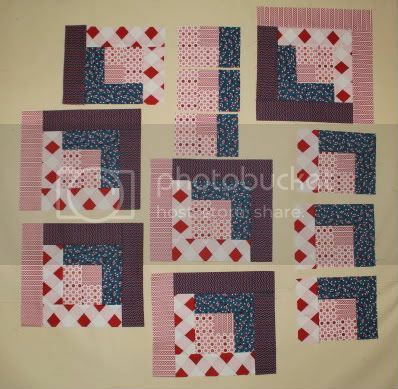 I did decide to add another row of red and blue, so they'll finish 14" square.